Support her in her hoops dreams with this girl basketball personalized Christmas ornament with its own display cord. The basketball swish girl Christmas ornament personalized from Russell Rhodes includes the details you share with us. A lettering pro adds them by hand in a font more stylish than used in our example, and your gal will have a personalized girls basketball ornament she can hang on the tree or from her gear bag. 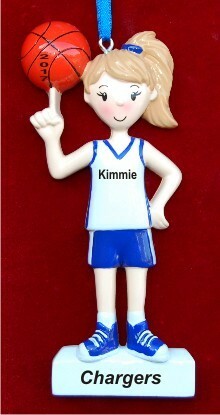 This is one of many girl basket ornaments that includes those with other hair and skin tones, uniform colors and more. We include our custom velvet gift pouch with your order of the girl and basketball ornament.